A US senator wants to develop new technology which would remotely destroy the computers of people who illegally download music tracks. Senator Orrin Hatch, a Republican representing Utah, asked technology chiefs at a hearing in Washington about whether they could develop ways to damage or destroy the computers. Legal experts have said any attack on people's computers would contravene the US's anti-hacking laws. Mr Hatch said damaging computers "may be the only way you can teach someone about copyright". "No-one is interested in destroying anyone's computer," said Randy Saaf from MediaDefender, a company which develops ways to disrupt illegal music downloads. "If we can find some way to do this without destroying their machines, we'd be interested in hearing about that," Mr Hatch said. "If that's the only way, then I'm all for destroying their machines." He said if a few hundred thousand people suffered damage to their computers, the online community would realise the clampdown was serious. He advocated sending two warnings to computer users about illegal downloads. On the third transgression, their computer would be destroyed or damaged. 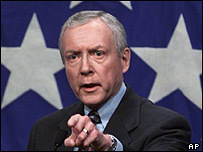 "There's no excuse for anyone violating copyright laws," Mr Hatch added. Mr Hatch is a composer himself, having earned some $18,000 (£11,125) from his music in the last year. Senator Patrick Leahy, the committee's senior Democrat member, later said he thought Mr Hatch's plan was too drastic. "The rights of copyright holders need to be protected, but some draconian remedies that have been suggested would create more problems than they would solve," Mr Leahy said. "We need to work together to find the right answers, and this is not one of them." A spokesman for the Recording Industry Association of America (RIAA) said Mr Hatch was making a point that if networks did not clamp down on copyright infringement "Congress may be forced to consider stronger measures". Last year, Democratic senator Howard Berman drew up a bill that would allow artists to carry out "hack-attacks" on the computers of people who had downloaded tracks illegitimately.